1893-1896: Liverpool rocking between 2nd and 1st division - LFChistory - Stats galore for Liverpool FC! LFChistory's series on the formative years of Liverpool FC, began with John Houlding's split from Everton that gave birth to Liverpool. Part two detailed the club's first ever season that ended in highly controversial circumstances. After winning the Lancashire league in the first year of their existence, Liverpool's climb up the league ladder started in 2nd division. A real fairytale season was ahead and the club's biggest game to date against the most famous club in England in the FA Cup. In 1893 at the General Meeting of the Football League it was decided to increase the number of League clubs, but Liverpool FC's request for a 1st Division place was turned down. John McKenna jumped the gun and sent an unauthorized telegram in the name of the club's secretary, William E Barclay, for the club to be admitted into the 2nd division. Later that night a telegram arrived from the Football League, saying: "Liverpool elected. Come to London to decide fixture list tomorrow at three o'clock", to Mr Barclay's bemusement. Liverpool were admitted following the demise of their more illustrious neighbours, Bootle. Liverpool had lost both of their main goalscorers, John Miller (25 goals) to The Wednesday and Tom Wyllie (15 goals) to Bury and would struggle for goals in the 2nd division if replacements were not found. Malcolm McVean, who netted 12 goals the season previous, scored the club's first ever league goal in a 2-0 win over Middlesbrough Ironopolis in the first game of the season. Liverpool scored plenty of goals as they took the 2nd division by storm, and were undefeated, winning all 14 home games, winning 8 and drawing 6 on the road. 22-year-old James Stott, who arrived from Middlesbrough, was on fire, scoring 14 goals in 17 games in his only season at Liverpool. Thomas Bradshaw also boosted the forward line on his arrival from Northwich Victoria with 10 goals in 18 games. He wrote his name in Liverpool's history books by becoming the club's first international player when he made his England debut on 20th of February 1897 vs. Ireland. One of Liverpool' most colourful games at this time was a 4-3 away win vs Small Heath on 14th October as Birmingham Daily Post reported: "The match was marred by a very regrettable incident which occurred shortly after the commencement of the second half. Small Heath scored an equalising goal, but Liverpool claimed the ball had passed through a hole in the side of the net. The referee very properly refused to listen to the protest, and the Liverpool players, or at any rate a number of them, infused a considerable amount of roughness into their play. McQue, the centre half, a strapping fellow weighing twelve or thirteen stone, was the chief offender, and at length he kicked Mobley, the little centre of Small Heath in the abdomen. It was apparently an intentional kick, and the referee at once stopped the play. Scarcely had he done so, however, than Jenkins, the Small Heath captain, incensed at the act of McQue dashed at the Scotchman and threw him to the ground. For this he was ordered off the field, and took no further part in the game." Liverpool competed for the first time in the FA Cup, having failed to enter the 1st round in the club's inaugural season, winning two qualifiers, but losing their third vs. Northwich Victoria. Liverpool, now a 2nd division team, went straight into 1st round, facing 2nd division Grimsby on the 27th of January, beating them easily 3-0. Next up in the cup was the formidable Preston North End team. Preston were champions in the first ever League season in 1888-1889 without losing a single game, nicknamed "The Invincibles". Preston won the League following year, but had finished as runners-up for three years running and were FA Cup semi-finalists the previous season. Liverpool had never faced such an illustrious opponent, even though admittedly Preston were not having their best of seasons. This was without a doubt Liverpool's biggest game so far and was eagerly awaited: "For the last week or so nothing but the one topic has occupied the attention of all local sportsmen while, the pros and cons of the probable chances of the two teams have been eagerly and animatedly discussed... The capacity of the Liverpool ground, officially admitted to be about 17,000, was fully tested, so much so that hundreds were turned away a quarter of an hour before the game started." Liverpool began the long awaited battle with pace and power: "The 'Blue and White' monopolised the greater part of the game, and, if not showing such scientific and pretty play as their more renowned rivals, were by far the most effective and dangerous team, especially during the second half. Dame Fortune bestowed one of her rather unlooked-for favours in the shape of a goal to Liverpool when the game was but four minutes old." The match lived up to everybody's expectations, each team hitting the woodwork after Henderson's fourth minute goal for Liverpool. The home team scored again but Preston responded straight away: "With a splendid cross shot McVean added a second point to the team's score. Hardly had the game been restarted when Gordon and Cunningham took the ball into the corner, and after some little finessing it was centred into a favourable position, and Ross rushed up and crashed the leather through, without giving McOwen a possible chance." 2-1, the half-time score, Preston's scorer a future captain of Liverpool. Becton, another player who later joined Liverpool, equalised for Preston in the second half and the atmosphere at Anfield was at a boiling point: "The fight now began if possible even more earnestly, each side striving every nerve to gain a leading point, but Liverpool staying the better outplayed the Preston team, and succeeding a nice run by Gordon, Henderson converted the pass of the former in a most finished manner into a third goal. From now to the finish the game was most keenly contested, both goals undergoing sharp attacks, and a welcome cheer was raised when the whistle blew, leaving Liverpool winners of a most sensational game by 3 goals to 2. Liverpool, wisely stuck to their own game, in which none of the brilliant passes, as shown by the visitors, were to be found; but instead there was the irresistible dash always present, the promptness to benefit by a little slackness on the part of an opponent, the vivacity of the forwards and the half-backs, which seldom allowed North End to do any telling work, and by timely and judicious attention extended to the visitors' attack combined to secure victory." McLean excelled against Preston but right-back Andrew Hannah was considered the star performer in this famous victory: "If any portion stood out better than the other it was the half-back trio, who were ubiquitous. McOwen was so well shielded by his captain [Hannah] and McLean that he had the occasion to use his hands only once throughout the game. Hannah's display was almost perfection, and that, too, against two of the finest forwards in England (Becton and Cowan). Against the wind it was a treat to see his coolness, now covering the impetuosity of McLean, and anon making virtually a second goalkeeper with his foot and head. McLean did magnificent work, and played one of his best games, his terrific kicking being of great advantage to his side when playing against the wind." Liverpool won the famous Preston team against all odds and were drawn to face another 1st division team in Bolton two weeks later. Liverpool were going places and the writers of Liverpool Mercury were suitably impressed: "The career of no football club has been followed with such interest as that of Liverpool. 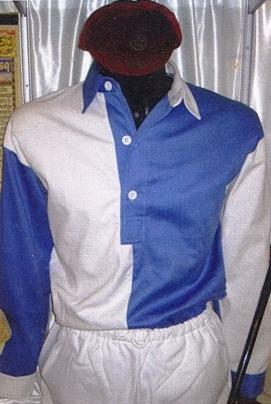 By its rapid growth and almost phenomenal prosperity the club has risen to a very high position, and its fame has caused the eyes of the football world to revert in the direction of the Mersey, and when these young aspirants went to Bolton to contend with the Wanderers, so great was their reputation that the largest crowd ever assembled on the Wanderers' ground eagerly awaited their appearance." However, the occasion got to the Anfielders and they lost 3-0, which proved to be Liverpool's only defeat of the season. Despite falling victim to Bolton Liverpool gained invaluable experience playing two top-flight sides. Liverpool won the 2nd division quite comfortably, 8 points ahead of Small Heath (later Birmingham), but that didn't however guarantee automatic promotion and Liverpool had to play a test match against the bottom team of 1st division, Newton Heath, that later changed its name to Manchester United. Liverpool took the lead midway through the first half: "Liverpool were making good progress, when a foul gave them a further advantage, McLean sending in a grand shot, when Gordon headed through twenty minutes from the kick-off." Liverpool added a second: "Liverpool then racing off in good combination, several good shots sent into Falls, who kept a good goal, but was beaten by a grand shot from Bradshaw after some clever passing by the right wing and centre, this second success being well received by the Liverpool supporters," reported Liverpool Football Echo. Liverpool won 2-0 and would be in 1st division company next season! Liverpool Review commented on Liverpool's title triumph: "On arriving at Tithebarn Street station the team was met by an enormously big and correspondingly enthusiastic crowd. Different players were carried shoulder high to their special conveyance and after lubrication at the Alexandra Hotel the men drove off to the Sandon where another tremendous reception awaited them."